The original project goal was to raise 100 California Sycamore from seed and to plant them over time on the Carpinteria Bluffs, a nature preserve overlooking the Pacific Ocean, allowing for the gradual removal of large, invasive Tamarisk trees without significant impact on the bluff’s horizon scenery. 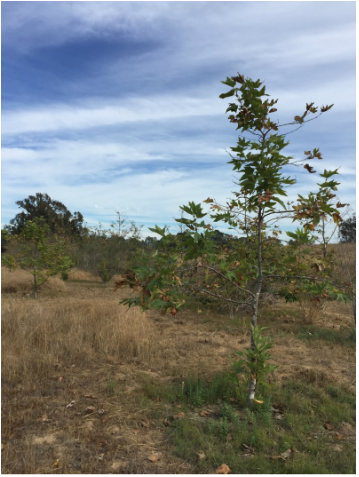 Eventually, our goals broadened and we planted 200 of the 2-3 year old trees in other nature preserves and parks near Santa Barbara. We partnered with the Carpinteria City Parks, and the South Coast Habitat Restoration to plant the young trees in the bioswales by the bluffs and along the length of Carpinteria Creek. When we embarked on this project we had high hopes for the survival of the majority of the young trees, but unfortunately this was at the very beginning of the 5+ year drought in Southern California. Recently, members of The Garden Club of Santa Barbara with the assistance of Park volunteers and the Director of the South Coast Restoration, walked the Bluffs and the Carpinteria Creek to check on the status and photograph the surviving sycamores. The trees that were planted higher up the creek, did not survive, but we found some along the bioswales and riparian corridor where additional water was brought in this summer, and in the lower creek beds near the ocean where water and runoff pools. Only a fifth of the sycamore we grew from seed and planted managed to survive the on-going drought. However, the majority of these survivors of drought and gophers have grown to about 15 feet.